On November 26, 1936, three weeks after television transmissions began in England, Mr G.B. Davis of Dulwich (south–east London) paid 99 pounds. 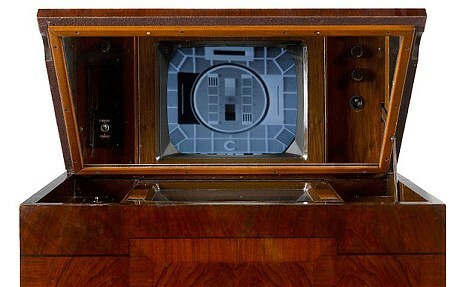 15 shillings– over half the average annual wage of the day, equivalent to almost 4,000 pounds today– for the seventh television set manufactured in the UK, a Marconi “Type 702, number 1-007.” The receiver had a 12-inch screen contained in a walnut and mahogany case, with a mirror in the lid onto which the picture was reflected. But poor Mr. Davis (presumably along with his fellow early enthusiasts) was able to enjoy his pioneering purchase for only a few hours: three days after he took the plunge, the nearby Crystal Palace and its transmitter burned down. The area could not receive television pictures again until 1946. But Mr. Davis’ loss is his grandchildren’s gain. Bonham’s is set to auction the set later this month. There are more Stradivarius violins in existence that pre-war TVs, so the auction house expects the set to fetch much more than it’s pre-sale estimate of 5,000 pounds. 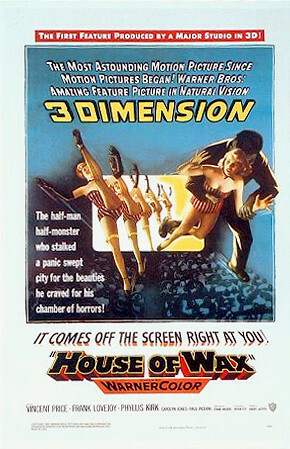 As we summon memories of Sid Caesar and Soupy Sales, we might recall that it was on this date in 1953 that the first color 3-D feature film premiered– House of Wax. Shot with a two-camera process, and viewed through “stereo” glasses with differently tinted lens, the film grossed a then-impressive $4.3 million. It launched its star, Vincent Price, on a career in the horror genre, and goosed the careers of his supporting players, Phyllis Kirk and Charles Buchinsky (who shortly thereafter changed his name to Charles Bronson). House of Wax kicked off the first period of enthusiasm for 3-D films (the second, a year-long period in the 70s); we are, of course, currently in the third.